'Your Voice' is clearly Madhouse's attempt on creating something as succefull as 'Kimi no Na Wa' and 'Koe no Katachi'. Your Name + A Silect Voice = Your Voice. Like dude, could you be any more obvious? Unfortunately, they even failed to impress the audience who typically likes this type of drama. Kimikoe is what I call a slice of life mess. It's a 90 minutes long life story which simply said contains too much, yet doesn't really even know what it is supposed to be about. Nagisa, our main character is apparently a lacrosse player. If you don't know what lacrosse is, it is a sport which is practically the combination of softball and floorball which is played outdoors on a field similar to american football. This, like pretty much everything else in the movie, is completely irrelevant. The writing is on real thin ice. It's fairly similar to 'Sora yori mo Tooi Basho' except there is no adventure in this one. Apparently, all of this is just an excuse anyway because the only real purpose why this movie exists is the drama. Nagisa seems to be some sort of emotionally unstable girl whose past story doesn't give us much more info about her other than she used to cry as a child and misses her grandma, and all sort of non- butterfly-and-rainbows level stuff happens to her until she finds out what real friendship is. It's quite hard to find any sort of emotional connection to her and what she is "going through" simply because she randomly goes to random places and random things occur without there being any sense to any of it nor any single believable reason for her to do anything she is doing. The storytelling is presented in a way where viewers just randomly discover new factors that pop out, assumably the actual story was written similarly. Just random ideas thrown here and there because they wanted this movie to be "something more" but really it just became "less". Production-wise, this movie doesn't achieve much. When it comes to the art and sounds, the character design distantly reminds me of 'Hourou Musuko' which is the nro 1 reason why I even watched this movie. The seiyuu cast contains some big names, but Nagisa herself is casted by someone whose crying scenes and acting convey zero emotions and zero characteristics. Outside this, there isn't anything worth of noting. As a conclusion, I didn't especially enjoy watching this movie. It was just very dull and felt both: pointless and amateurish. The fans of 'Sora yori mo Tooi Basho' might stll find it worth of their time because they are rather similar overall and made by Madhouse. I'm not sure if this is actually an adaptation, but "Kimi no Koe wo Todoketai" sure feels like one. You can almost see before your mind's eye the numerous subplots cut and character development missed during the film's roughly 90 minutes of runtime. It feels like a small slice of a much bigger whole, trying to do much but ultimately accomplishing little. The story has way too many characters, and thus most of them remain largely undeveloped. Their personalities and roles can be described in a single sentence. Heck, the girl with the pigtails seems to serve absolutely no purpose aside of serving cookies to the others and being shy. The plot itself also seems to go in way too many directions for its own good, attempting to juggle numerous plot threads at once (just to name a few: the comatose mother in the hospital, the estranged childhood friends, the amateur radio station, the main protagonist's plans for the future), but ultimately not giving most of them the time and attention they deserve. The art style is... let's say minimalistic. It was hard to tell at times whether I was watching a series or an actual film; if this actually had a significantly bigger budget compared to you everyday anime, they didn't do much with it. It surprises me, because I tend to associate the Madhouse studio with higher quality. That said, the film is not at all unwatchable. It's more like a "cute trainwreck"; the overall message and content is generally fun and heartwarming, but behind it all seems to hide a one-cour series or OVA that would have had enough room to do this concept justice, and which never actually got made. One of the things that can really tackle down my enjoyment of an anime is when it present itself in an original matter, but falls into the classic pattern of it's own genre once it actually starts. Kimi no Koe wo Todoketai is also one of those cases. A well made slice of life movie, pushed down by it's unability to make itself different. But let's start from the scratch. I was really looking forward to seeing this after reading the synopsis, which seemed a bit inovative compared to all other slice of lifes. I expected a story about how broadcasting can change lives of a lot of people and I thought the movie is gonna focus on the bigger picture. In this case, on all the people that can get to listen to our main heroine's voice. Did that happen? Sadly not. The movie itself starts off almost the same way as every nowadays movie does. It's end of the year, summer vacation are coming and our presented friends are planning on what to do. However, on her way home, Nagisa, our main heroine, stumbles upon an abandoned café. She tries to explore it and finds an old radio station. She can't resist and makes her very first broadcast. Sadly, that's where things start going down. Not down in the matter of quality, but in the matter of how is the story presented. Until now, even if only in details, a lot of things seemed a bit original compared to others. The girls are playing lacrosse, Nagisa does a lot of personal things like shouting her problems into a ringing bell and, of course, the plot is about broadcasting. Honestly, was this idea ever even used as a main plot device? Even if yes, you can't but say that it sounds interesting. However, what the movie does is, instead of focusing on the broadcasting itself, it goes down to the classic cute girls slice of life. Nagisa is maybe the main heroine, but in about the third of the movie, membership of the "radio club" suddenly jumps up from two to six. And with that, the plot losses a lot of it's originality. It doesn't feel like something impactful anymore, it seriously feels like just another school club setup, which wasn't the case early on, and shouldn't have been the case even later on, if you ask me. The characters themselves, while having decent chemistry, act in a very generic matter. We have the maid-like girl who serves café and says dumb things. We have the Tsunderish aggresive type that always wants to compete with her childhood friend even though she's better at everything. Then there's the obsessive girl, and the always calm one. You see, I don't tend to brag about originality all that often. However, this movie really doesn't do a very good job at making characters diverse. Or original, for this matter. A big problem that relates with the characters not being top-notch comes up when they want you to feel for them. Actually, talking about emotions, the whole movie doesn't do a particulary good job at making you care when it matters. For the most part, it's pacing is quite good. However, there are about two or three moments which drastically change the set tone just in order to make the characters shed some tears. Not only these moments feel indredibly forced, it also damages the impact of the last minutes, which, looking from todays perspective, was the only time tears were supposed to pour. Also, while it's almost a necessity to end up a slice of life in a happy matter, this whole movie was one of the most straight-forward I've ever had the pleasure of seeing. That in itself isn't really that big of a problem. However, I have a hard time not critisising the movie for it's predictability when I could literally picture the ending scene 10 minutes after it all started. Art is, on the other hand, an area in which the movie pleasantly suprised me. Every scene looks very clean, polished, some of the background shots were borderline beautiful. Even moments that tend to be very sloppy, like bike riding, were animated in a respectful manner and added to the fact that is all is very nice to look at. Sound was OK. I took this review from the negative side of things more often than not, but please, don't let it mislead you! 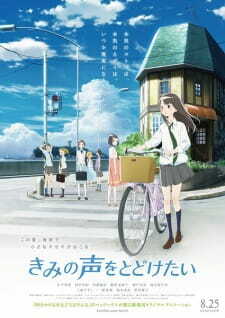 Kimi no Koe wo Todoketai is definetly not a bad movie. Just a one that ended up a bit bellow my expectations. And that has to affect my rating in one way or another, no matter how much I wanted to love it. Story: Kimi no koe wo todoketai is about a group of friends restart a radio station to achieve a the mother of one of they friends how is in a coma for 12 years with the spirit of kotodama. It's a nice and calm slice of life story about friendship, family and love. Art:The art style of this anime movie is simple and colorful. It's reminds me of little witch academia art style some how. It's a simple art style also pretty unique in this own way. Sound: I really like the sound it clear and calm to listen to. The music in this movie is really done well. I love the songs they are beautiful. Characters: The character are not really special. They kind of flat and boring sometimes. I like some of the characters like Nagisa but the most of the cast is not that special at all. Enjoyment: Because of the colorful animation and that I want to know what go to happend at the end make me finish this movie. I was not a bad movie but because the drama not really happend till the end and it was more a slice of life story than a drama. because of that it was not really that interesting to watch at all. I like the animation stye and the music a lot but beside that it was not that special at all. Overall: I enjoy watching this because of the animation and music. I don't Recommend this movie if you like drama movie because it more a slice of life anime. If you enjoy your slice of life anime this is maybe a nice movie to watch. Besides sorry my English isn't that well. Kimi no Na Wa x Koe no Katachi = This?